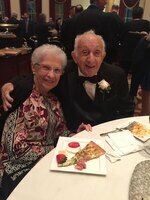 Vincent Tavella Obituary - Philadelphia, Pennsylvania | Vincent Gangemi Funeral Home, Inc.
Age 91, on Jan. 20, 2018. Beloved husband of the late Frances (nee Spadaro); Devoted father of Steven (Donna) and Gary (Susan) Tavella. Loving grandfather of Kristen (Neil). Justin (Tiffany), Lindsey (Frank) and Franca. Great grandfather of Bianca, Giavanna, Leila, Nicholas, Santino, and Nicolette. Dear brother-in-law of Emma Tavella and Emma Spadaro. Relatives and friends are invited to his viewing and funeral Thursday morn. 9 to 10:45 A.M. at St. Nicholas of Tolentine Chruch, 910 Watkins St., Phila Pa 19148. Funeral Mass to begin at 11 A.M. Int. New St. Marys Cemetery. To send flowers to the family of Vincent "Jimmy" Tavella, please visit our Heartfelt Sympathies Store.